Unlike Chapter 13 bankruptcy where you repay most of your debts to your creditors, most debts are forgiven under a Chapter 7 bankruptcy after some of your assets are seized and sold. For the court to determine which assets are to be liquidated, you must submit a Statement of Intention that explains how you propose to maintain or dispose of your property. After filing your petition for bankruptcy with the court, you must submit a form called an Individual Debtor's Statement of Intention. You must identify all debts that are secured by property that you own and the name of the creditor holding the secured debt. The form also requires that you indicate whether you intend to retain ownership of the property or surrender the property to be sold by a court appointed trustee for the benefit of your lenders. You also must state whether you are renting property under a current lease and whether you intend to give up the rented property or continue with the rental agreement. The Statement of Intention only requires that you disclose property that is used as collateral securing a debt and not any other property. The most common secured debts are your home and your vehicle. Your home is secured by a mortgage and your car is secured by a title. Secured property would be subject to foreclosure and repossession if you were delinquent on payments and not otherwise covered by bankruptcy protection. On the Statement of Intention you must indicate your proposed disposition of the secured property. You may choose to surrender the property to the trustee to sell at auction. In the alternative, you may attempt to keep the property by claiming it as exempt under state and federal laws from seizure by the court -- such as clothing and wedding rings. You also have the option of redeeming the property by paying the outstanding balance owed on the debt or by reaffirming the debt owed to the lender. If you reaffirm the debt you are committing to repay the loan even though you filed for bankruptcy protection. You must file the Statement of Intention within 30 days after the petition for bankruptcy is filed with the court or by the date set for the first meeting with the creditors, whichever happens first. The bankruptcy judge may allow an extension of this deadline if you make a written request and show there are compelling reasons for more time. After you file your Statement of Intention, you have 45 days to surrender, pay off or reaffirm your secured debts. If you fail to meet these deadlines, the court could seize the secured property and sell it at auction. 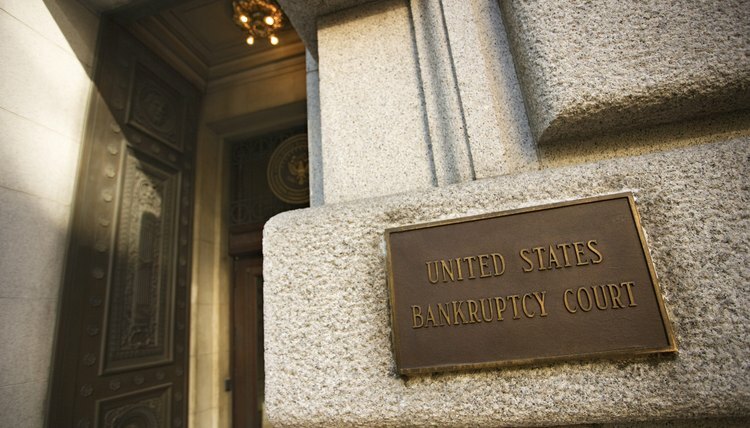 Bankruptcy Law Network: Debtors Can Lose The Lease In Chapter 7 Bankruptcy. Why? Two types of bankruptcy are popular among individual debtors: Chapter 13 and Chapter 7. In a Chapter 13 bankruptcy, you pay all or a portion of your debts over time, following an approved payment plan. Chapter 7 bankruptcy, by contrast, is the liquidation of your nonexempt assets -- if you have any -- to pay creditors. Nevertheless, you don't lose all your assets in a Chapter 7 bankruptcy -- and are granted a discharge of debts.